Home > Posts tagged "time shares"
Are you familiar with the term cognitive bias? 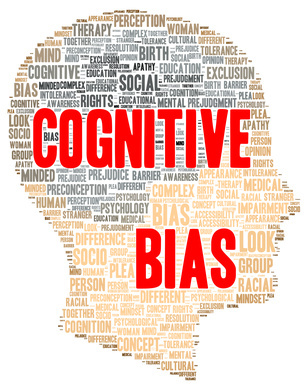 A cognitive bias represents an error in reasoning or decision making when you disregard accurate information in favor of your subjective preferences and beliefs. In other words, you exhibit a cognitive bias when you “go with your gut” rather than more objective information. Taken to an extreme, cognitive biases can lead you into bankruptcy, or can prompt bad choices when you are in bankruptcy. Here are some examples. Have You Fallen Victim to the Sunk Cost Fallacy? One cognitive bias I see frequently in my bankruptcy practice is the sunk cost fallacy. It usually takes the form of a client refusing to surrender an expensive and unaffordable house or car because “I have put so much money into that house/car I would be throwing all that money away if I gave it up.” Obviously, your financial capacity to pay a car note or mortgage in the future has nothing to do with what you have invested in that item in the past. Either you can comfortably afford your purchase or you can’t, and if you are contemplating bankruptcy you should fight against the sunk cost fallacy. There is an old saying “don’t throw good money after bad” which is the correct frame of mind if you are struggling with a sunk cost decision.